Let me start by telling you that I have absolutely no nutritional training what so ever. It's almost laughable to think because if I did it's highly likely I wouldn't have gotten as big as I did. That aside, I've written this post to tell you what I'm doing to lose weight, at this point I've lost 2 stone 3lbs in eleven weeks and I've used this method for roughly around the past 9 weeks. When I say "method" this is actually extremely basic food maths with calorie counting but before I started losing weight I had no idea what to do, how many calories to have to lose weight or how many I should even eat for my body, 1400 vaguely rung a bell. Although what I'm about to say is basic, I figured I'd still write this post as it is working for me and if you have MFP and Fit Bit then perhaps you can do this for a few weeks. You may need to read this post more than once for it to click but hopefully I've explained it well enough. Virtually all of what I've learnt is from others and then researching online but definitely search online for more indepth / professional advice! So the first thing I've learnt was that we are all burning calories every moment of the day, even when we're completely still, sleeping or whatever. The amount of calories that you actually burn depends on a lot of factors, your age, your gender, your height and weight. This is called your Basal Metabolic Rate (BMR) and the first thing you need to do is to work out yours. Click here. Now of course, that's the absolutely basic amount of calories that you will burn each day, exercise will raise this figure significantly, depending on how much you do but I'll talk about that more in a minute. The next thing you need to know is that reducing your calorie intake by 500 calories a day (3500 in total for the week) lower than the amount of calories that you burn equals a one pound weight loss at the end of the week. Of course that would mean that as a rough guide, reducing by 1000 calories a day lower than the amount of calories you burn will equal an expected weight loss of around two pounds a week. So, back to the BMR rate. If you click here it has the Harris Benedict Equation calculator where as you will input the same information as earlier only this time you will also tell it how much exercise you do. This will tell you your BMR with the expected amount of calories you will burn on top of that. Once you know this amount you can roughly work out what you want your calorie deficit to be in order to lose weight. Of course this is only approximately as you will have more active days than others unless you're using a device to measure it, this is where my Fit Bit comes into it. I will also go over my own numbers in a second so hopefully it will become clearer if it's not at this point. 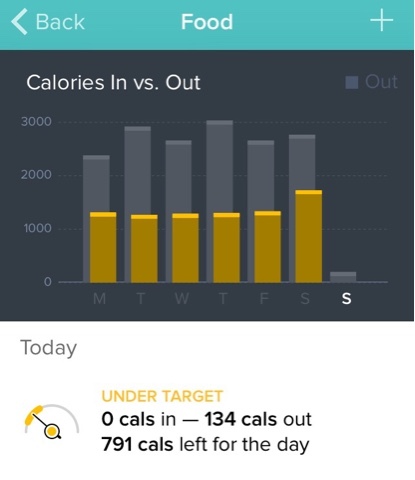 I'll explain how I used My Fitness Pal and Fit Bit. They are linked so what I put on one is brought over to the other. 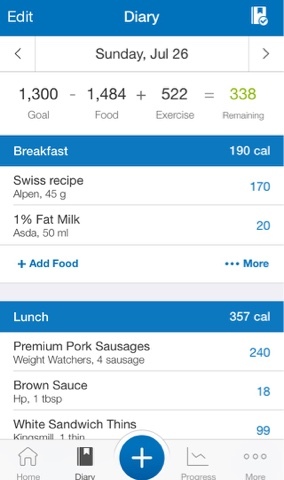 I use MFP to log my meals. I tend to do them a day in advance and the most important thing for me is to log the evening meal, even if I don't log my breakfast or lunch in advance. The reason for this is because I don't want to get to the evening and realise that nothing I want to eat / have to eat is within my remaining calorie limit. I will log everything that I eat there which I find is best to log as I go otherwise it's easy to forget the little things that you threw into your mouth whilst stood in the kitchen...! 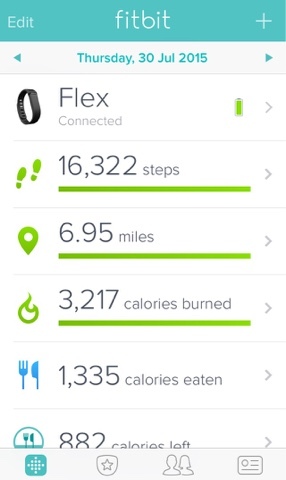 You need to set your Fit Bit so that it knows your goals. 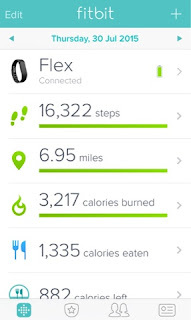 I have the Fit Bit Flex which I'm using with an iPhone so I can only really tell you the settings on there. If you click 'Food' it will ask you if you want help setting a goal or if you want to set it up yourself, click the help option. You'll then need to put in your current weight and your goal weight and it will give you plan intensities. Of course, if a 500 calories deficit is a pound then 250 is half a pound so it will give you the 'easier' option. 'Harder' (1000 deficit -2 pounds a week loss) It will also work out the dates you will reach your goal weight, depending on which option you choose. I'll talk about my numbers just so that you can get an idea of how I've been losing my weight so far. My BMR is 1868 calories, so that's the rate I burn calories even when I'm not moving. As I can sometimes not be very active, if I put myself down on the Harris Benedict Equation as 'sedentary' then it estimates that I will burn 2242 calories a day which of course is my 1868 plus a few hundred for the little movement I will do in the average day. If I want to lose a pound a week then this means I need to eat 500 less than what I burn which is of course 1742 calories. I however want to lose over two pounds a week so I need to have a deficit of 1000 calories, bringing my daily allowance to 1242 calories. Now I have to say, typically I've been losing close to three pounds a week and this is because I try to be as active as I can each day so I try to stick to 1300 calories eaten but burn anything from 2500 - 3000 which is of course 1200 - 1700 calorie deficit. As long as I ensure that my calorie intake is typically within the 1300 goal that I've set myself, then I will just check the Fit Bit app throughout the day. I'm checking that I have moved enough to burn a high enough number to ensure that I have more than a 1000 calorie difference between calories in and calories out. To check this on my Fit Bit I will click the 'calories eaten' section and it will bring up this table shown on the left. 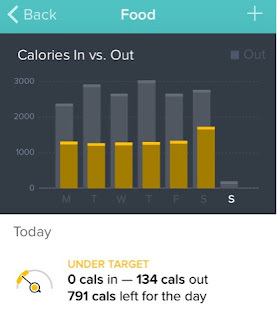 As I have my goals set with Fit Bit, it knows the targets I need to reach with both my calorie intake (the coloured bar) and the calories burned (the grey bar) Throughout the day the coloured bar will change depending on where I am up to in my goals. If it is yellow then I am more than 50 calories 'under' target, green means 'in the zone' (aka - I'm spot on target) and red means I'm more than 50 calories 'over' target. Now from what I've learnt, under is where I want to be or at a push, in the zone providing I am eating a good amount of calories to keep my body going which is strictly over 1000 each day at least. As you're burning calories every moment then you would be best to check this chart throughout the day but eventually I've gotten used to knowing roughly where I'll be and what the overall number of calories I will burn in total just by knowing the amount of steps I've done. The truth is I never though it could be as simple as it is. I do try and eat balanced meals. There are things called 'Macros' which is effectively the ratios of protein, fat and carbohydrates you're eating to avoid you eating too much of each one and not enough of another. MFP tends to work out your macros for you but you can change them if you want to build muscle etc. Basically the bottom line is that you may lose weight eating within your calories but rubbish processed food but you wont be healthy on the inside so it's important to choose your calories wisely, we all know what we should be eating afterall. Wow I feel like a drill sergeant saying that last bit, I freaked myself out there a little. Anyway, I'll finish with a disclaimer. Everything I've said is my own thoughts but please seek professional advice where needed, I can only speak for what's been working for me. I truly hope you've found this post useful! If you want to read my Slim Down Sunday posts - click here.